This rustic hand stitched wedding sign is a wonderful addition to your wedding decorations and will become the perfect keepsake! Place it with your guest book or use it as a focal point one on the reception tables. This personalized wedding stitchery will make a great wedding or anniversary gift too! Each hand-stitched framed wedding sign is personalized with the couple's first names, wedding date and chosen saying. It is hand-stitched on onsaburg for a country rustic look. Names, date and saying are stitched in black. The heart is sewn by hand with a layer of quilt batting to add dimension and texture. The heart can be sewn in any color requested. I'll be happy to color match wedding fabrics or to use floral, calico, etc. upon request. The heart in the photo is a white-on-white print. The heart is sewn with ragged edges to add to the rustic feel of the wedding stitchery. All names, dates, and saying are centered above and below the heart. 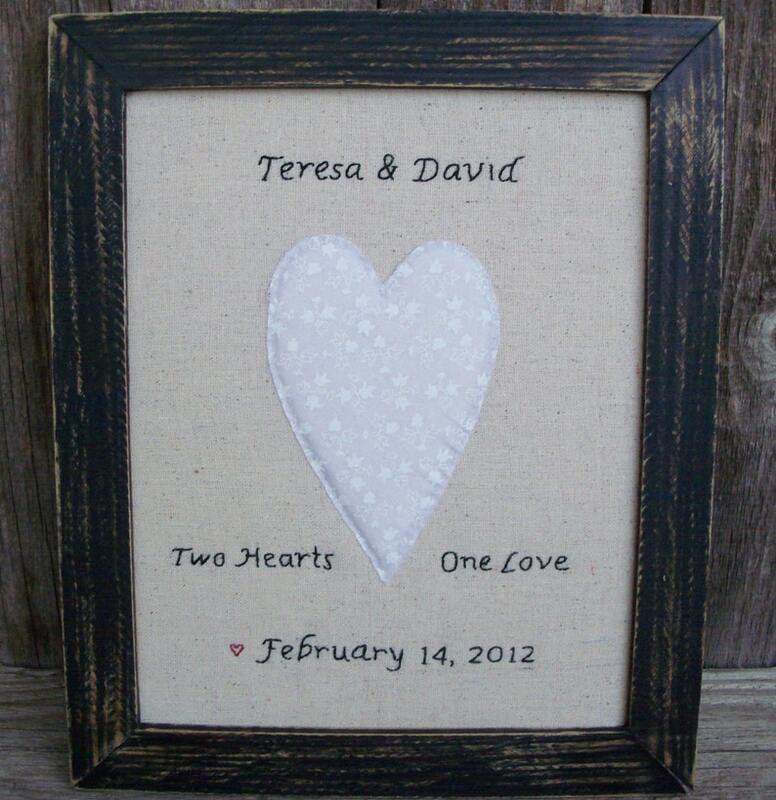 *The small red heart on the stitchery in the photo was a custom request by the couple. If you want a tiny heart by the date - please let me know. The tiny heart can be sewn in any color of your choice. The wedding stitchery is framed in a black wood frame handcrafted by me. The frame is lightly sanded to give a slight country rustic feel to the stitchery. A sawtooth hanger has been added to the back for your convenience. It is approximately 9 - 10 inches x 12 inches (22.86cm x 30.48cm). A small handcrafted solid wood display stand can be included with this stitchery - allowing your framed stitchery to be displayed anywhere (similar to the one shown in the photo). You can choose this option at checkout. --- Please provide the names and wedding date in the "notes to seller" box at check out. I will convo you to reconfirm the information provided and the spelling, so that there are no mistakes when completing your stitchery. My stitcheries are stretched and attached directly to the frame, so they will not sag or bubble as time goes by. Tape is not used. My frames are made from 1 1/2 x 1/4 inch (3.81cm x .635cm) pine and are backed by 1/4inch (.635cm) wood. They are made to provide a rustic country feel to compliment my stitcheries.